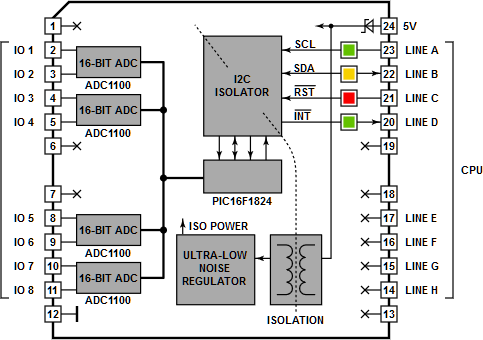 This ADC Tibbit uses four ADC1100 16-bit analog-to-digital converter ICs. All four converters are used in the differential mode, i.e. the "+" and "-" lines of each ADC are exposed to the outside world. ADCs are connected to a PIC16F1824 microcontroller. PIC micro interfaces ADCs to the main CPU of the TPP board and also stores the calibration data in its EEPROM. This calibration data is written into the EEPROM during manufacturing, when each ADC channel is individually tested and calibrated. The calibration data reduces the full-scale error caused by the imperfection of ADC input divider stages (not shown on the diagram). To lower noise and improve resolution, this Tibbit has its own isolated power domain. •Each channel measures signals from -10V to +10V. •With our official Tibbo BASIC library (performing the data correction using the calibration data) you can measure the voltage level on one channel in about 140ms. •Effective flicker-free resolution is better than 13 bits. •Zero offset error is within 0.005% of the input signal's scale (20V, from -10V to +10V). •Full-scale nonlinearity error is around 1% (after the range correction). 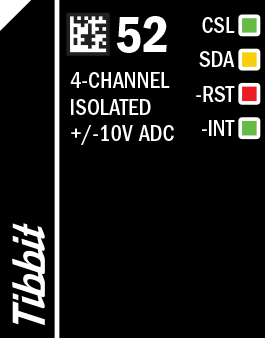 Combine this Tibbit with #20 (nine terminal blocks) or #19 (DB9M connector). It's not common but possible to use the latter for wiring into the ADC's inputs. There are two red, one yellow, and one green LED. The first red LED is connected to the SCL line of the I2C interface, the second one – to the -RST line of the PIC micro. The yellow LED is connected to the SDA line of the I2C interface. The green LED is on the -INT line. The use of this Tibbit is illustrated by a Tibbo BASIC test project. Yo can find it here: https://github.com/tibbotech/CA-Test-Tibbit-52.